Ok well its not really mine it’s Nigellas but I am sure she won’t mind! I am a big meringue fan, I love seeing it in any form on a menu and I never have a celebration in my house without serving it. This version I think though is my favourite. Gorgeous marshmallow textured meringue, softly whipped cream and some berries. So simple but yet impressive. It’s easy to get a pavlova wrong but this is simple, promise! Slice, eat, sigh in that order! Heavenly! Wow, that looks really vibrant Paula. Nothing beats cream, fruit and good ol’ meringue. 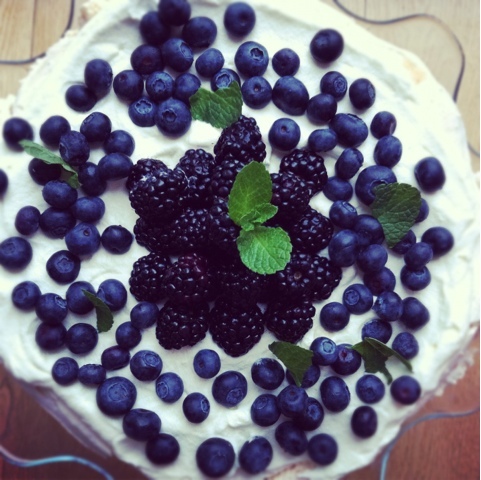 That pavlova looks seriously delicious! Can I come to your next celebration please? Such a pretty picture! Looks fabulous. Yummy yummy! I love pavlovas and that one looks fabulous! I love pavlova and this looks gorgeous! Love the colour contrast of the blueberries and white cream in the photo. Nicest looking pavlova I’ve ever seen. I’ll try to emulate for my hubbies birthday next month. Just wondering have I got timings and temps correct … Preheat to 180, drop to 120 when you put it in, leave for an hour, turn off oven and leave in til it’s cool? Perfect Carrie! I try and make it at night, bake for an hour and then leave to cool in oven overnight.